Among those who purchased a smartphone in the previous six months, 40.8% purchased the Android OS, up 3.2 points from the previous month, and up 13.3 points from 27.5% in June. 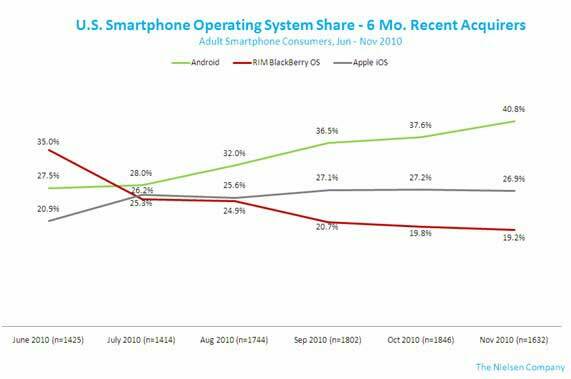 Apple followed with 26.9% of recent smartphone purchases, down 6.0 points from June, while 19.2% of new buyers chose the RIM BlackBerry, down 18.8 points from six months earlier. 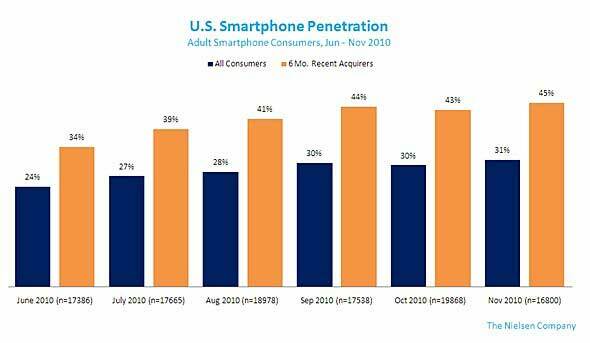 All three leading mobile players, however, are benefiting from strong demand for smartphones: In November, 43% of recent acquirers bought a smartphone over a feature phone, underscoring how much room remains in market overall. So are you an iPhone or a Droid?